Hi everyone! Welcome to the Mama Elephant July Stampede! You've already seen the peeks of the July release over at the Mama Elephant blog, and the new release is now live and available for purchase in the store! For the stampede, I'm working with the new set Stitches! I was a seamstress (sewer? sewster? lol) long before I started up with cards, so this set really speaks to me. Even now that I'm addicted to paper, I still break out the sewing machine every now and then:) More often than not, I'm sewing up a little gift. So today I thought I'd show some tags I made up to go with my little sewn goodies! For each tag, I used the tag stamp from the set No Peeking (remember that one from last Winter?). 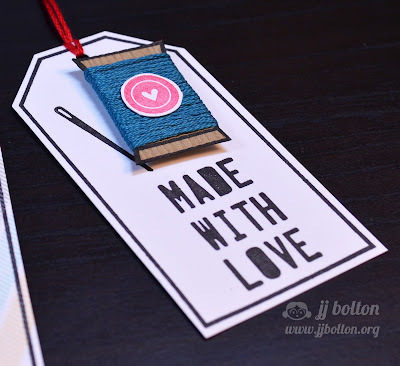 This tag is my favorite of the three:) I stamped the spool image onto woodgrain paper and fussy cut it. Then I wrapped it with embroidery thread. So cute! The other 2 tags are easy peasy one-layer tags. Perfect for putting in the post with no worries of them getting smushed! I love to pop these tags onto a package wrapped up in kraft paper:) Thanks for letting me share! Here's the list of all the hopper today! Big thanks to the amazing Karolyn for joining us this month (woohoo)! Thank you so much for stopping by!! And remember tomorrow, we start new stamp highlights! Lots of fun coming! Love how you added colour with the embroidery floss on the spool..so creative! Love the tags you made, JJ! So cute and colorful! Adorable tags. You made the most out of this set. Oh my goodness....soooo cute! Love that loose thread look! What great tags JJ! Love that one with the spool especially! Beautiful! LOVE the twine wrapped spool!!! GET OUT! These are AMAZING tags! LOVE that wrapped spool and the colorful diag design!! And I LOVE how you paired the THX with this set-- CLEVER! You rock, JJ!! Love these tags. This is my favourite stamp set! 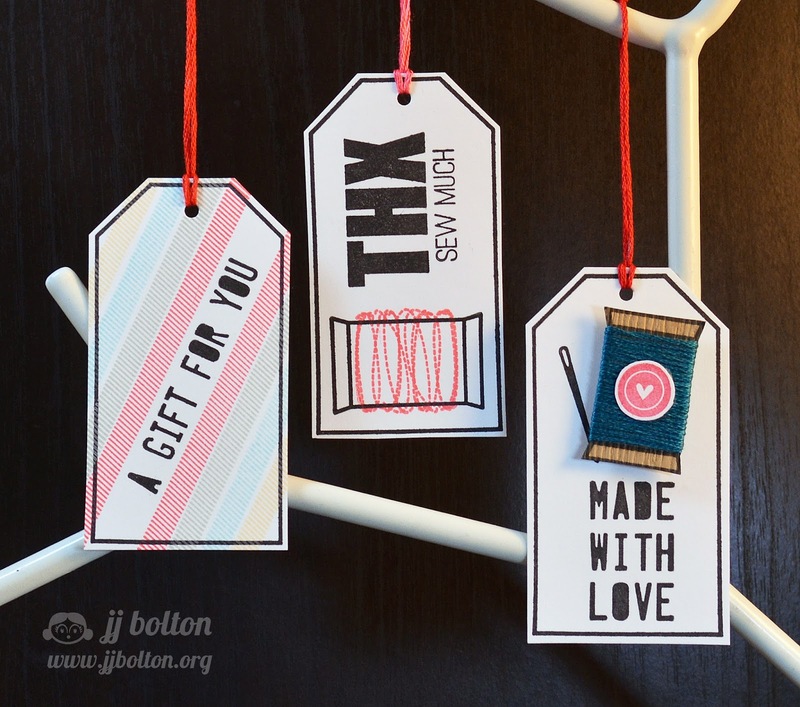 Very cute gift tags--especially for home sewn projects! These are just the cutest little tags. oohhh love their edgy feel! I'm already a fb fan too! Oh, how CUTE!!! You never cease to amaze me, JJ (do I always say that? )...well, b/c I mean it! Love your cards and tags so much!!! Sooo cute! Love the tags! Fantastic tags! So nice for a handmade gift and not as time consuming as a card can be. BTW the links to your blog from the blog hop contributors wouldn't work. I had to come back to ME blog and luckily that link is working perfectly! My favourite stamp set also is Stitches...and I really enjoyed seeing your gift tags! Oh my, these are super, super cute! I love them! 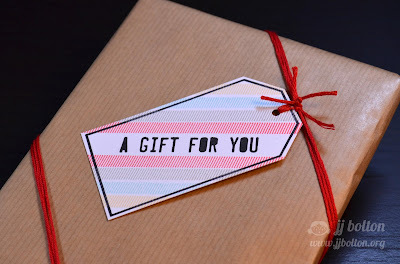 How perfect is this for your sewn gift tags! They are adorable. Nice job! How FUN...love what you've done with the tags! Those tags are too cute! Love how you used the stamps! Such perfect little tags, thanks for sharing! Wow! It is beautiful! 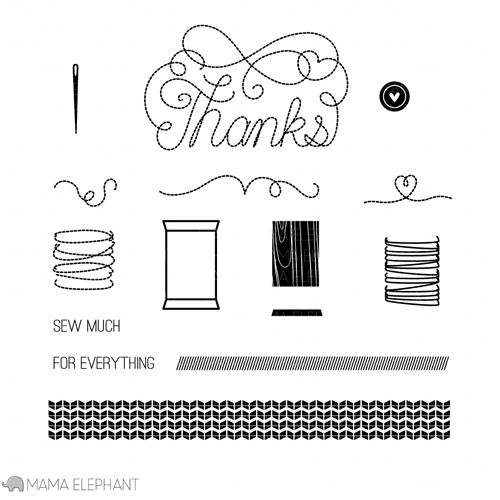 Love your idea on adding a thread to embroidery spool! This is a really cute stamp set and I love the bold colors on the tags. At first glance, I thought the embossed sentiment was hand stiched! Super cute tags, great as always. Such adorable tags--I need to do this more--they are so fulfilling, huh? I love the Full House stamp set best! I am a follower on ME's blog! I also am a follower (liker) on FB! Thanks! Love your tags JJ using the new Stitches set! I am a follower of the ME blog! I tweeted to ME on Twitter! Fun tags, JJ! Your fave is mine as well--love that spool! What a sweet set of tags! Love how you wrapped the one in embroidery floss!! So cute! These are so fun! Love those fonts. LOL! I love the term "sewster"! :D It sounds so much trendier than seamstress! I also love these sweet little tags! They're all adorable!